Overall, about 60% of the Americans eligible to vote (Voting Age Persons who are non-felon citizens) actually voted in 2012, according to data posted by Michael McDonald of George Mason University. According to McDonald's data, 2012 voter turnout is about three points below 2008 turnout, with much of the decline coming among Anglo voters. 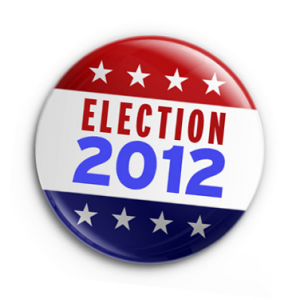 The number of voters from minority groups rose in the November 2012 election, a key factor in President Obama’s reelection. But those numbers went up for disparate reasons. 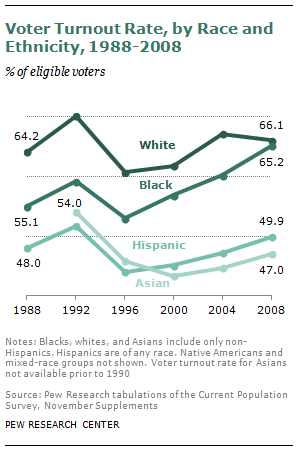 Among Latinos and Asians, population growth has steadily driven up the number of voters. Turnout rates also have gone up, but remain significantly lower than those of the population as a whole. The nation’s African American population, by contrast, has remained steady, but the number of African American voters has continued to go up because of increasing turnout rates. African Americans make up about 12% of the U.S. population, but were 13% of the voter turnout, according to the 2012 election day Edison Research for the National Election Pool exit poll of more than 26,000 voters conducted for a consortium of major media organizations. Anglo Americans made up about 71% of the voter-eligible population and 72% of the turnout, the exit poll indicated. The large African American turnout was critical to Obama’s victory in several swing states, Ohio, in particular, according to a recent analysis by the Center for American Progress.